Benji is a black and gold Shiba Inu. 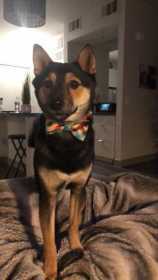 He was last seen wearing an orange Texas Longhorns collar with a blue plaid bow tie. He was last seen in the Sunrise Gardens community located on Sahara between Sloan and Treeline. He is extremely friendly. We need him home. REWARD IF FOUND!